The Oktoberfest in Munich sees as many as 6 million people descending on the Bavarian city, the two-week festival sees over 7 million litres of beer served. This slot from WMS might just be ideal for those on planning to make the trip, certainly helping you to get into the mood, while also possibly giving you a nice boost to the bankroll. While there are now many more slots with similar themes, Bier Haus is still the classic in this niche. This slot was famous in live casinos for many years. It can now be found online (outside of the US) at the popular Unibet Casino. You’ll get 10 free spins with no deposit, then up to 250 more free spins if you decide to join – check out www.unibet.com and check out Bier Haus now! There are two characters on the reels. The first is a cheery moustachioed beer drinker. This man is served by the buxom, blonde waitress who plays the most pivotal role in the whole game. The highlight of this slot is certainly the free spins round, where sticky wilds can really boost the pay-out. The setting for this slot is within the stone walls of a castle, this castle obviously having a license to serve beer. The symbols are all nicely designed and add much colour to the dark green backed reels, while the two characters in the game are the most eye catching. Throughout your time playing you are met with an ambient soundtrack that transports you to a Bier Fest setting, with much chatter and the clinking of glasses throughout. Entering the feature brings the atmosphere up a notch too. Here a cheerful accordion tune really brings the game to life. Bier Haus from WMS is a five-reel slot, each of the reels showing four symbols (making it slightly larger than the many 5x3 slots you’ll find online). The game has a total of 40 win-lines and players will simply multiply their chosen coin value by the number of lines to see the total stake for each spin. This slot pays from left to right and you’ll need three or more symbols in a row to win. The highest paying standard symbol is the male character. He seems completely happy with his lot – he has a beer in hand, a large handlebar moustache, a green hat and a huge smile. You’ll be smiling too if you manage to land five in a row as 500 coins will be heading your way. A medieval style German city dwelling has a top prize of 150 coins while a bier symbol is next on the pay table with a win amount of 125 coins. The standard symbols are completed by a tankard, an accordion, acorns and four colourful symbols related to the suits of playing cards. The wild symbol is represented by a clutch of three large bier glasses, each looking delicious with their golden colour and white frothy head. This symbol will substitute for any other symbol on the reels apart from the bonus symbol which is represented by the waitress / barmaid. The blonde barmaid acts as the bonus symbol in the game. There are two different symbols featuring this lady – one showing her with beer in her hand (the golden girl symbol) and the other without. To activate the free spins feature you’ll need to land five or more of these symbols consecutively. Five might seem a high number to activate a feature but when you consider they are stacked this is much easier to achieve than you might think. Land the minimum five and you’ll have five free spins, but every additional symbol will add another five spins. For example, 6 bonus symbols will give you 10 free spins, while 8 bonus symbols will give you 20. When the spins start, any of the bonus symbols which show the barmaid holding a beer will now become wild throughout the feature. This will make each spin potentially much more profitable than usual. More good news is the fact that you can retrigger the feature at any point, with five (or more) spins being added to your existing total. You’ll be tapping those toes throughout the bonus feature. Some traditional Oktoberfest style music plays. Summing Up – What Makes the WMS Bier Haus Slot So Special? 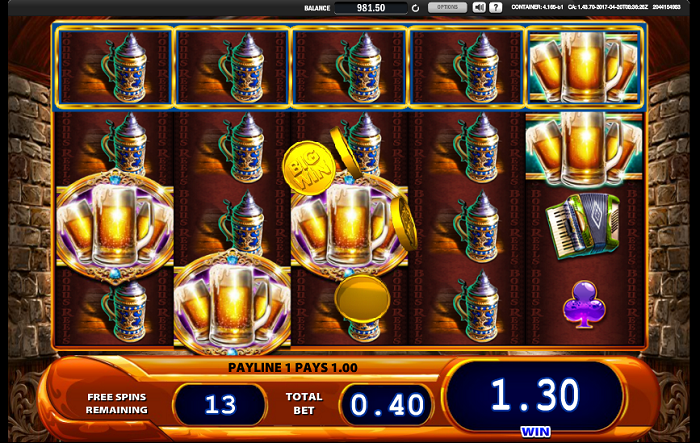 Bier Haus is a fun, friendly and atmospheric slot from WMS. It does not take long at all to understand how this game became such a live casino classic. The pleasing visuals alongside the upbeat soundtrack to the game really does a great job of getting you into the Oktoberfest mood, while the gameplay really helps things along. With 40 win-lines on the oversized reels, there is plenty of opportunity for line wins. The slightly unique way of entering the feature can mean that the free spins round can give you a lot of spin. Add the sticky wilds into the mix too and you have a feature that can certainly pay out. 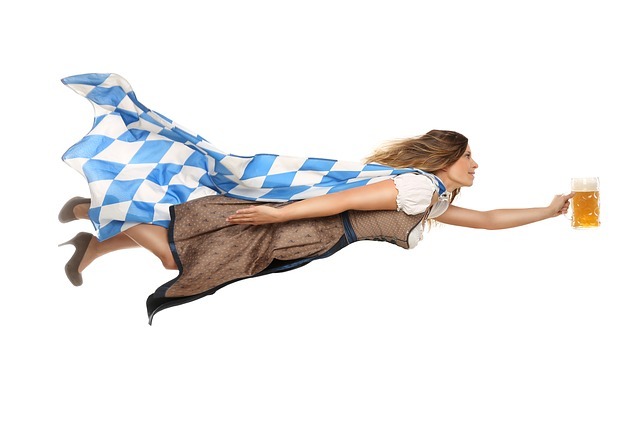 It might even fund a trip to Munich this very October…!